How do artists respond to the world in a timely manner when gallery exhibition cycles can’t keep up? Alumni Kenny Komer (A'06) and Boris Rasin (A'05) take their work to the streets. Working with a third member under the collective name of Concerned New Yorkers—an organizational identity that evokes a Super PAC moniker—these recent graduates create compelling, politically-minded public works that are often covered by the media. This month they released their most recent project, Citation, into the world and have already gotten more than a few reactions. "We strive to reach a very wide audience," Rasin says, "but we also try to appeal to the cerebral element of our audience." The Citation project began with the group distributing thousands of fake parking tickets around lower Manhattan. 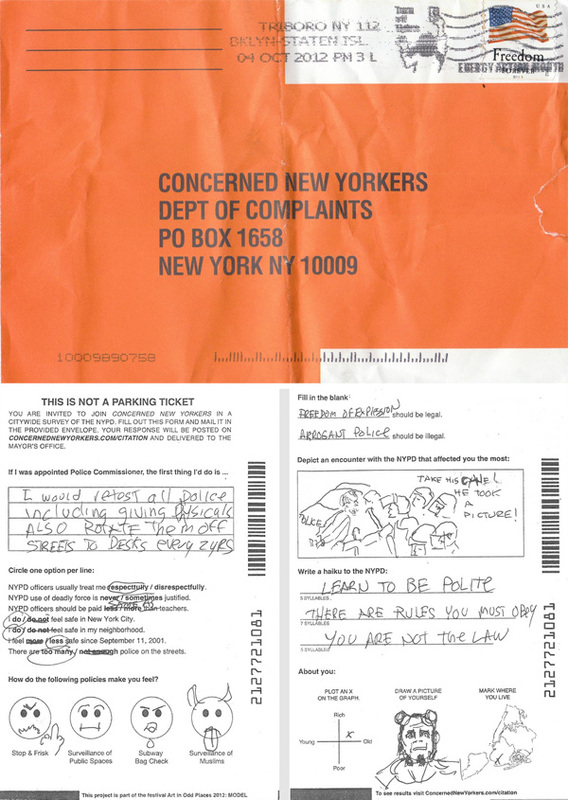 The tickets were in fact cleverly designed packaging for a survey the group was conducting on perceptions and experiences of the New York Police Department. Concerned New Yorkers publishes their survey results as they receive them (which can be sent in with an attached pre-paid mailer) on their website. Metro NY and Time Out New York have already reported on their efforts. It's a perfect example of the duo's rapid-response approach to art-making. "Because our projects are so quick to produce and turn-around we can make work about things that are very topical, very of-the-moment," Komer says. The inspiration for Citation came from a recent personal experience Komer had being stopped and frisked by police on his way to a meeting with Rasin. The stop-and-frisk program, in which police will stop pedestrians and may frisk them if the police feel they have cause, has recently become a controversial issue between civil liberties groups and the Bloomberg administration. Komer and Rasin have already cut their teeth on several similarly interventionist projects in Manhattan's public sphere. The founding project, Burns for Mayor, was a direct response to billionaire Mayor Michael Bloomberg’s controversial bid for a third-term in 2009. Concerned New Yorkers decided to give Bloomberg a run for his money by pitting him against C. Montgomery Burns, the nefarious billionaire energy magnate of the Simpsons universe, as a write-in candidate. The two artists set about creating a website, promotional video and punchy campaign poster ("No Third Terms! 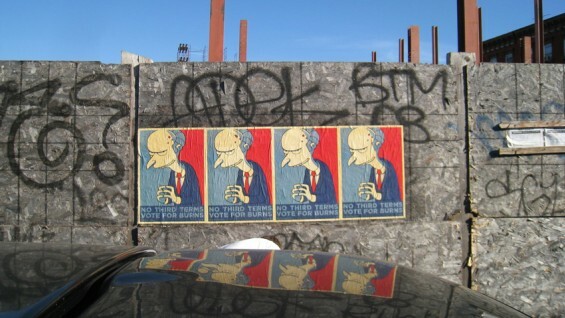 Vote Burns") plastered throughout Manhattan. Soon local and national media turned the campaign viral, getting the attentions of CNN, the New York Times and the Huffington Post, which later called it, “a smash.” In the end, Burns received 27 write-in votes—the highest of any write-in candidate that year. The friendship between Komer and Rasin started at Cooper Union, where both came to study more conventional forms of art-making. Rasin had the natural talent at painting and drawing to win admittance to Cooper’s highly selective School of Art, but went on to try his hand at every medium he could find: video, photography, digital arts—finally settling to focus the brunt of his energies on sculpture, which he recalls studying closely with Nikki Logis, Doug Ashford, Pam Lins, and Dennis Adams. Komer meanwhile came from a sculpture background but found the interdisciplinary Cooper education liberating. “I think the most valuable thing I learned at Cooper was how to be resourceful,” he explains.